With £2.5 billion in loan finance under their belt, Funding Circle have done a rebrand to their website. However, it’s not just the front end that’s changing: soon Funding Circle are removing the ability for manual investing and reselling. So in other words, they are removing the ability to manually select which loans to buy and sell and replacing it with two autobid options. If you have an existing portfolio you will still hold the same loans after September 18th, but won’t be able to specifically choose which loans to sell on the secondary market. So, taking their predictions at face value it could mean a large number of investors who opt for the balanced account earn slightly higher than before. 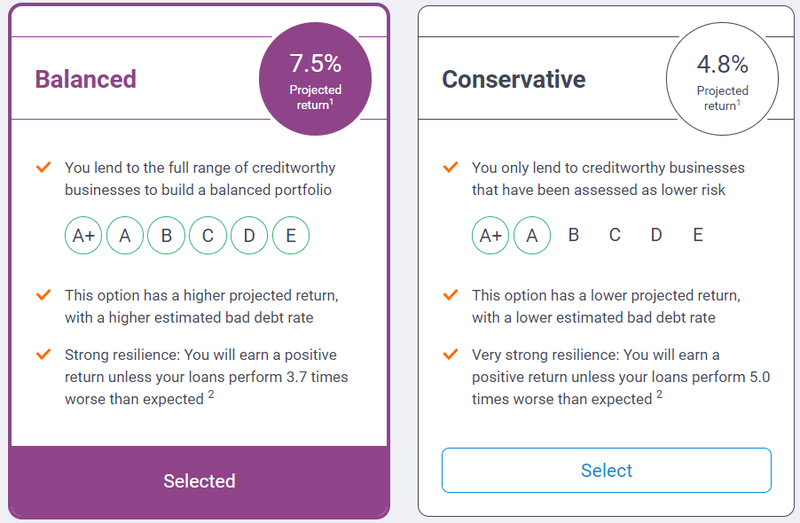 This is all very similar to the way Zopa works for investing in consumer loans. With Zopa you just have the option to invest in ‘lower risk’ or ‘higher risk’ accounts – Zopa Core and Zopa Plus respectively. You have a direct contract with the borrower for each loan, and can see a breakdown of your portfolio by downloading your loanbook. It made sense with consumer lending – many small individual loans and consumer privacy to be respected. Now it seems Funding Circle want to replicate this model with SME business lending. Small time traders/ flippers. Some people made nice profits buying and selling loans on the secondary market. The ability to add premiums or discounts to loan parts allowed for some gains. Others had theories about buying a fresh loan on the primary market and then selling a number of months into the term – taking advantage of a non-linear risk profile over the loan term. Bots & trading algorithms. More advanced investors who had invested time and perhaps money into making automated trading systems or bots to scoop up the highest interest primary market loans as soon as they became available. Those who genuinely enjoyed reading through the business proposals and learnt from investing their own money in them. Those who liked to invest ethically – avoiding certain types of business and helping out others. Those who beat the average through their loan due diligence alone. Those who just invested in the lower risk bands (C’s, D’s and E’s) hoping for a higher risk/return. The majority of investors who just want a hands-off, automated investment that gives a decent return. Funding Circle – their life becomes easier. There are definite losers with this change but for the majority, investing with Funding Circle is going to get easier. If the predicted returns are to be taken at face value, the majority who go on to opt for the balanced portfolio may see a small increase in their Funding Circle returns. They will be more likely to get a piece of higher risk loans (if they want), won’t have to buy at a premium on the secondary market and don’t have to be scared about the auto-lend picking up the scraps from more manual investors. One thing I am not sure about is if there is still some ability for certain privileged users or institutional accounts to retain their ability to select loans. I hope not! Also, this puts a lot of trust in Funding Circle to maintain a high level of due diligence on behalf of all investors.